This is a limestone mountain in the Chiang Dao Wildlife Reserve area, Chiang Dao District. This cone-shaped mountain is 2,195 metres above sea level, which makes it the third highest mountain in Thailand after Doi Inthanon and Doi Pha Hom Pok. Narrow plains on top of the mountain overlook spectacular views that include a sea of fog on the Chiang Dao District side, Doi Sam Phi Nong, the Chiang Dao mountain range, and the far end of Doi Inthanon. The peak is cool and windy and has an abundance of rare highland flowers, birds, and butterflies. An approval letter from the Director of Wildlife Reserve Division, Royal Forest Department is required in order to visit Doi Chiang Dao. Travel must be arranged at least 2 weeks in advance. Contact tel. 0-2561-2947 for more information. Getting there: The peak is accessible by foot. At Chiang Dao cave, guides, porters, and chartered transfers to the starting point of the trail are available. Rented local truck costs around 900 bahts and the fee for a porter is 300 bahts per person. There are no tourist facilities on Chiang Dao Mountain. Visitors must bring their own sleeping bags, food, and water. 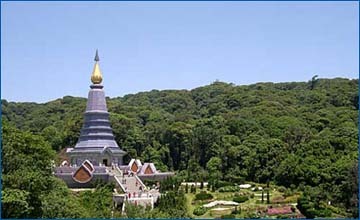 Located at Muang Ngai Village, the stupa was built by the local people in honour of King Naresuan the Great when he camped on the spot with his troops during his war with Burma in 1604. This charming cave is located in Chiang Dao Sub-district, approximately 72 kilometers from Chiang Mai town. 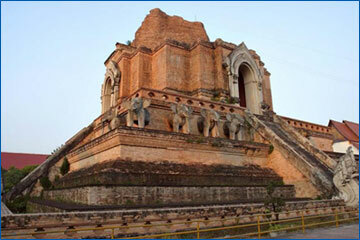 To get there, take the Mae Rim route, turn left at the entrance route and proceed for 5 kilometers on an asphalt road. For adventure lovers, this is a perfect spot to test your limits. Visitor has to climb a staircase to reach to cave. A stream in front of the cave is where several kinds of fish can be spotted. Touring in and around Tham Chiang Dao with a local guide is possible by contacting local guides in front of the cave. A service fee is charged.